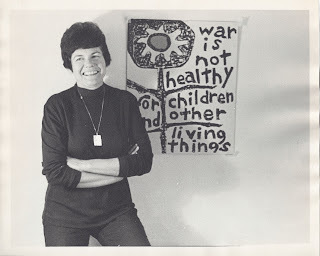 With the Memorial Day holiday upon us and it being a holiday of remembrance for the soldiers who have died in wars fought by the United States, it seems timely and appropriate for this post about Lorraine Schneider, an artist raised in Boyle Heights whose 1966 print, "Primer," decrying war has been an iconic image since. 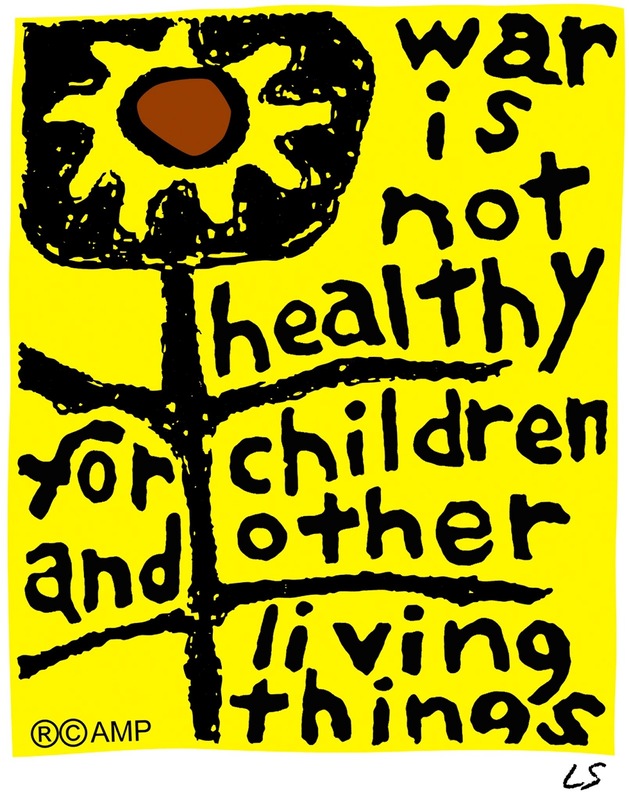 Lorraine Schneider's "Primer" (1966) was created for an exhibition that limited entries to those of four inches square or smaller, but had a huge impact with its straightforward anti-war message and eye-catching yellow background and simple sunflower motif. Courtesy of Another Mother for Peace, Inc. In fact, one of the highlights of an Autry National Center symposium held last week to kick off the newly-mounted "Jews in the Los Angeles Mosaic" exhibition was the artist's daughter, Carol, discussing her mother's life and work with attendees touring the gallery. 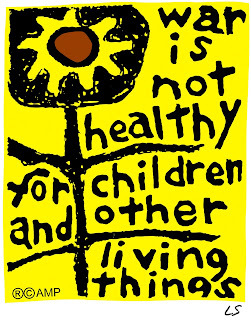 There is something so profound in the deceptively simple elements of the bright yellow background, the basic sunflower motif, and the pointed phrase, "war is not healthy for children and other living things," that it is easy to see why the work generated such universal appeal after its creation during the height of the Vietnam War. And, Lorraine Schneider's formative years were spent in Boyle Heights. Fittingly, she was born Lorraine Art in Chicago in 1925, but moved with her family to Los Angeles just a couple years later. Her father, Sam (originally surnamed Ordzek) was from Poland and mother Eva Chayet hailed from Russia. The Art family resided near City Terrace for a period and then later lived closer to the focal point of Brooklyn Avenue and Soto Street. 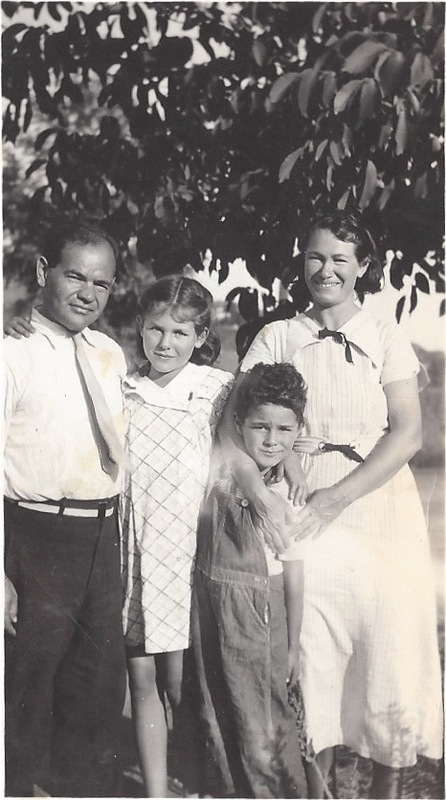 Sam Art was a tailor and a route man for a linen supply company, Eva had an artistic background, and Lorraine's formative years spent in working class and multi-ethnic Boyle Heights had a tremendous impact on her. The Art family in Boyle Heights, ca. 1935. From left is Sam, Lorraine, Seymour, and Eva. Courtesy of Carol Schneider. In a biographical sketch found on the Web site (see here) for Another Mother for Peace, a non-profit organization founded in 1967, it is stated that she was profoundly affected by the forced relocation of Japanese-Americans to camps and the attacks on Chicano and black "zoot suiters" during World War II. She vividly recalled being spat upon by guards when she and others went to visit Japanese-American friends being held at the Santa Anita race track in Arcadia before being sent to camp. Lorraine attended U.C.L.A. and studied art, but ended her studies to become an occupational therapist, working in army hospitals where she saw first-hand the devastating results of war on the soldiers she worked with. She completed her college studies at U.C. Berkeley and went to work briefly as a teacher in the Bay Area before marrying Stan Schneider, whom she met at U.C.L.A. She then devoted herself to her family, including four children. In 1960, she returned to school, taking graduate courses in printmaking at San Fernando Valley State College, now Cal State Northridge, and launched into a new phase of her life as an artist, in which printmaking, sculpture and painting were joined in an exciting type of art, but maintaining her foremost commitment to her family. The creation of "Primer" came as an entry in a exhibition, in which entries were limited to works that were only 4" square! Consequently, it was an imperative to create something striking and simple to make the greatest visual effect, but the message of the work took the entry into another dimension. 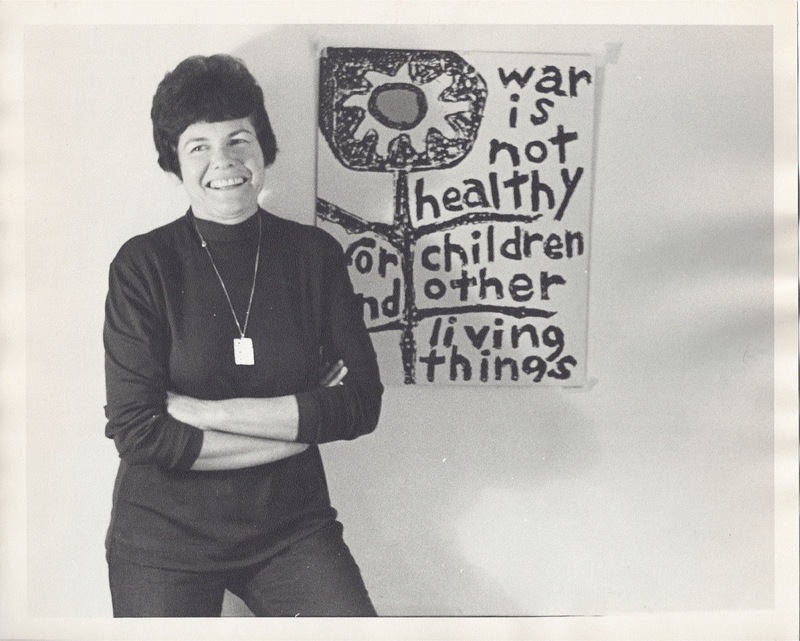 Lorraine Schneider with a poster of her iconic anti-war print, "Primer." Shortly before her death in fall 1972 she gave a speech at the United Nations Non-Governmental Disarmament Conference in Geneva that explained her motivation in creating the work. Courtesy of Carol Schneider. Lorraine's decision to donate the rights to her seminal work to Another Mother for Peace was a fateful and fruitful one. As noted above, "Primer" became an international phenomenon and its popularity brought significant funding for the organization and its anti-war message. The impact of the work was so significant that she was invited to speak at the United Nations Non-Governmental Disarmament Conference in Geneva in 1972. On 26 September, she presented a speech that encapsulated her long-held views about the futility of war. In describing what motivated here to create "Primer," she stated that what she really wanted to do was to create "my own personal picket sign." The point was to say something that could not be refuted and that was fundamentally truthful. She went on to observe that the nuclear age made war obsolete and that humans had to evolve to the point where disagreements could be handled in a non-military manner. She further opined that artists were those who had to lay the groundwork for people to take "the last step out of the cave." Lorraine concluded by noting that those who would restrict the expression of speech and free ideas, "gave me four square inches and this is what I did with it." Just a few days after returning home from Europe, Lorraine, who had been battling cancer for some time, was admitted to the hospital and died on 6 November. She was just 47 years old, but she created a small artistic and political jewel that has taken on a long and meaningful life of its own and is now as old as she was when she passed away. Contribution by Paul R. Spitzzeri, Assistant Director, Workman and Temple Family Homestead Museum, City of Industry with thanks to Carol Schneider for providing the photos for this post and for her inspiring talk about her mother's work. I had this as a light switch plate when I was a kid during the Vietnam War...true then, true now. Hi Diana, thanks for your comment and glad you saw this post.